Unless you are browsing in InPrivate mode (or have forced Internet Explorer not to store your browsing history), Internet Explorer collects your history as you surf the web. It will automatically clear your old history, and only keep the most recent, based on various settings you can configure. But what if you want to quickly erase your history? The most recent versions, Internet Explorer 8 and Internet Explorer 7, include a special mechanism that does just that, and lets you very easily remove websites and form data, cookies, etc. from your recent history (as you'll see in this tutorial, you can choose which portion of your browsing history to clear). Once you are in, press the Ctrl+Shift+Del keyboard shortcut (hold down Control and Shift keys, and press the Delete key, simultaneously). Internet Explorer will open the "Delete Browsing History" dialog, which contains all portions of history that are stored, and that can be individually deleted and removed from your computer. IE remembers your settings from the last time you cleared your history, so your options may look different (which checkboxes are checked). Just check or uncheck each checkbox, depending on what you want to erase, as we break down and explain below in the next few bullet points. 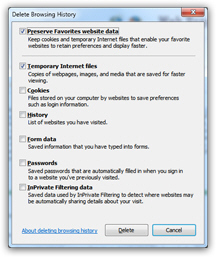 "Preserve Favorites website data" - leave it checked if you regularly visit websites you have bookmarked.
" Cookies" - check it if you want to erase your remembered user names and passwords, website preferences, your location (like zip code for weather), etc. "History" - check this checkbox if you want to delete all URLs (web addresses) stored inside the address bar, that autocomplete as you type an address or a keyword. "Form data" represents all your autocomplete data, as shown on the screenshot on the right. If deleted, you will have to type from scratch information that was stored behind the scenes. "Passwords", if checked, will mean that all your logins will be permanently erased - better make sure that you remember all of them before deleting them from Internet Explorer. Finally, leave "InPrivate Filtering Data" unchecked: this feature actually allows Internet Explorer to better protect your privacy. Click on the Delete button, and Internet Explorer will remove any traces of the pieces of browsing history you have selected above. This may take a moment, depending on the speed of your PC, the amount of browsing history to erase, etc. You have finished clearing your history, cookies, and/or cache in Internet Explorer! In the future, whenever you want to delete parts of your history, just hit Ctrl+Shift+Del, and hit Enter when the Delete Browsing History dialog opens, since Internet Explorer remembers from last time which data you wanted to erase. This is the fastest way to clear your history!